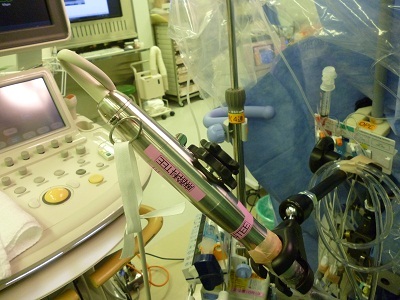 Off-pump versus on-pump coronary-artery bypass grafting in elderly patients. Acute kidney injury in the critically ill: is iodinated contrast medium really harmful? A multicenter randomized trial of atorvastatin therapy in intensive care patients with severe sepsis. Preoperative stroke and outcomes after coronary artery bypass graft surgery. General anesthesia with sevoflurane decreases myocardial blood volume and hyperemic blood flow in healthy humans. Ultrasound estimates for midline epidural punctures in the obese parturient: paramedian sagittal oblique is comparable to transverse median plane. A New Simple Method for Estimating Pleural Effusion Size on Computed TomographyMatthew P. Moy1, et. al. Crit Care Med. 2013 Apr;41(4):1124-1132. Echo didactics: the interventricular septum: measurement and motion. Ultrasound imaging for lumbar punctures and epidural catheterisations: systematic review and meta-analysis. Goal-directed therapy in cardiac surgery: a systematic review and meta-analysis. Br J Anaesth. 2013 Apr;110(4):510-7.